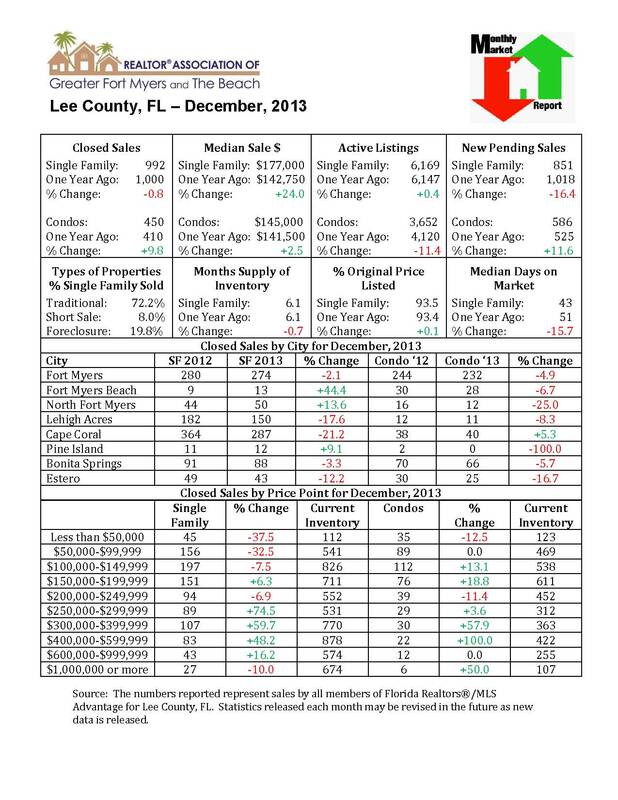 Let's talk big news first...LEE COUNTY'S MEDIAN PRICE CLIMBED 24% IN DECEMBER! Wow, big year over year jump from $142,750 to $177,000. So what does that mean to you? Well, most importantly it means Southwest Florida is in a healthy market. December sales of Foreclosures and Short sales totaled only 27.8% of the market, with the other 72.2% being traditional sales. This is great news as bidding wars are down and you are not competing with all cash investors all the time. 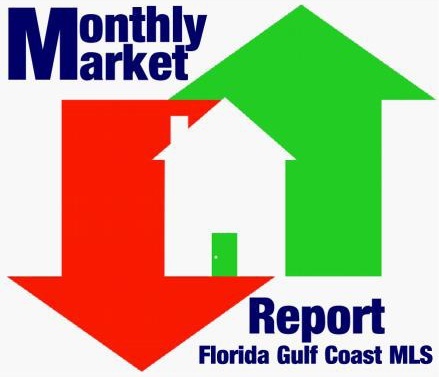 Sales in December were virtually unchanged, with 992 homes sold versus 1000 sold in December 2012. Overall we finished the year 3.2% greater than 2012 with 12,144 homes selling (11,765 for 2012). Okay so maybe you're not a buyer but looking to sell...how's the seller's market doing? Glad you asked! Inventory year over year remained the same with a 6.1 month supply of homes to sell. That's right in the sweet spot for a normal market. The best part is the days on market improvement. Last year the median days on market was at 51 days, now we have improved to 43 days! That's just over a week less to sell your home. Now keep in mind this is considering the home is priced at fair market. Overpriced listings will still take time to sell until either the market reaches you or until you come down to market. With peak season in full gear there will be plenty of buyers, and sellers making real estate transactions. But don't expect to be able to lowball offers. On average homes in December sold for 93.5% of the listed price. So keep this in mind if you are selling or buying, there's only about 7% wiggle room considering a fairly priced home. So let's sum all this info up. Prices are up but still historically very reasonable. With rates under 5% this represents one of the best opportunities to buy a home or sell. There is plenty of inventory for everyone to find what you need, just keep the offers reasonable. And if you're selling, we can sell your home in just over a month...not bad!! Well that's it for this months update. If you want to work with one of our real estate professionals simply call 239.671.4046 or click the contact us button to your right. We will get you the right home, in the right place, for the right price...that's the Pinnacle Promise!